"Trends and Directions in Data Center Interconnect"
Today with the ever increasing demand of the data center and network virtualization for information and communication technology services delivery has led Data Center Interconnect (DCI) to become an important aspect of service providers’ network architectures, enabling resiliency, load-sharing, and distributed workloads. Data Center Interconnect is also becoming a way to connect data centers in a cloud of virtualized compute and storage using SDN to automatically allocate resources as required. 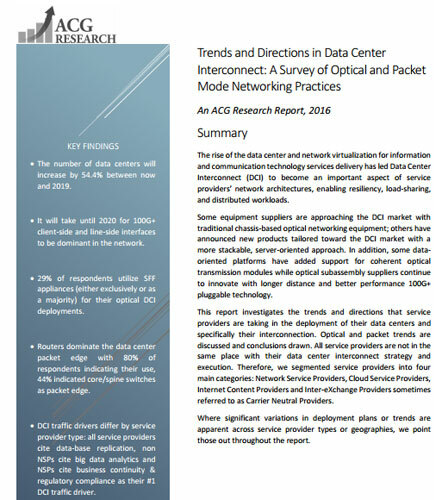 Connected directly with service providers utilizing DCI equipment or planning to deploy such equipment to interconnect their data centers in the next 12 months.